Fun group effort working on dinner tonight. An excellent evening with Eric, Dawn, Aeneas, Michael, Kevin, Kristin and myself. We made some tasty Persian beef soup. Even Aeneas tried some food tonight too (some vanilla yogurt) but I’m not sure he liked it quite as much. I made this tonight — rice, bacon, onion, celery, yellow pepper, orange cherry tomatoes from our garden, garlic, and some chili pepper flakes that gave it some good heat and make you want to cry like a broken heart. A small but tasty desert. 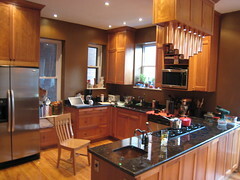 You are currently browsing the Serafini Studios Kitchen blog archives for November, 2007. Log in | Page built in 0.148 seconds.